STUART, Fla. /Florida Newswire/ — SFS Tax Problem Solutions Press announces the release of the eBook and Kindle Edition of “Now What? I Got a Tax Notice from the IRS. Help!” (B079XWL8P9) by Jeffrey Schneider. “Now What?” is also available in paperback (ISBN: 978-0692997154) and will be published in an audiobook version in June 2018. Reading these life-preserving tax tips with the stress-reducing facts shared in a down to earth style will help to reduce the intimidation, fear and the unknown when it comes to the IRS. In “Now What? I Got A Tax Notice From The IRS. Help!” Jeff defines and deconstructs the scary and confusing letters in a fashion that mixes attention to detail with humor and an intricate clarification of what is what in the world of the IRS. Using the information presented in this book as tools of navigation, floatation, and even resuscitation can help you to better understand the legitimate letters and notices as well as letters from the IRS private debt collectors and the scammers that have no relation whatsoever to the Internal Revenue Service. * How getting notices should not be as life-threatening as you may think. * There is life, sanity, and even money after receiving a notice. * You have choices, and you do have some control. The IRS is not always correct! * Even if you owe more than you can pay, there are other options. As filing deadlines come to a close and many choose the online route, Schneider states in the book: “An online tax program is only as good as the information the person enters into it and the understanding of what is being asked by the program.” He goes on to explain that “Online tax programs do not get to know their clients.” This can be very dangerous if the person does not know what they can or cannot add, deduct or for that matter, remember. 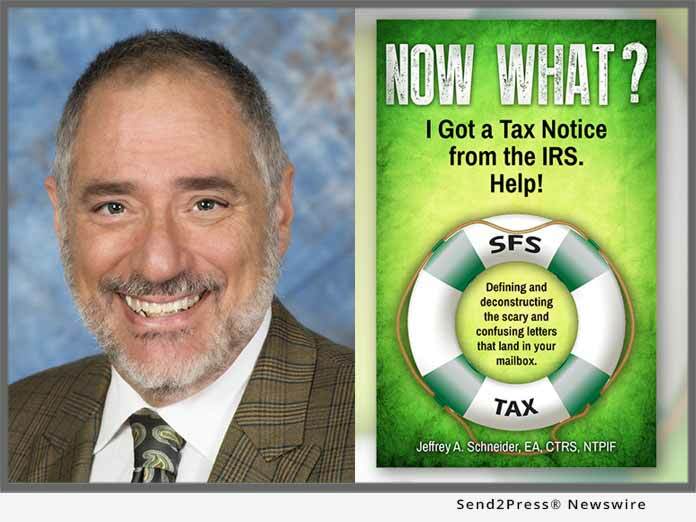 Jeffrey Schneider, EA, CTRS, NTPI Fellow has the knowledge and expertise to help you reach a favorable outcome with the IRS. He is the head honcho at SFS Tax & Accounting Services as well as the Enrolled Agent and Certified Tax Resolution Specialist for SFS Tax Problem Solutions. Schneider was recently appointed to the Internal Revenue Service Advisory Council (IRSAC). * Let the buyer beware of credentials and the people they buy into. * What can a tax professional do for you that an online program can’t? * The best steps to take in order to avoid an audit. * I got a Tax Notice. You can’t run or hide, so now what? * How do I pay the IRS what I don’t have? * How do you get the IRS off your back‚ temporarily? * I’m innocent, I tell you. I didn’t do it. * Having a tax debt that isn’t yours. * Can you really start over and get a second chance? * Private Collectors and other problems outside of the IRS. For more information about Jeffrey Schneider, visit: https://sfstaxproblemsolutions.com/ or http://sfstaxacct.com/. Publisher: SFS Tax Problem Solutions Press. ISBN: 978-0692997154; paperback, 6×9; 216pp; $9.97.